Use the links below to download my two eBooks on Workers' Compensation. Or read our informative blog which covers some of FAQs and common challenges. Dr. David Colvin, trained in orthopaedic surgery in Perth. David's specialty is knee and shoulder surgery and sports injuries. Making an insurance claim on a damaged car is a stressful process. But when it comes to making an insurance claim for an injury to your body, the stress goes up to a whole new level. If you have been injured at work, Dr Colvin can help you navigate the complexity of the workers’ compensation scheme while you recover from your injury. An eBook which comprehensively explains the workers’ compensation process from start to finish. It explains how claims get lodged, how claims get finalized, and everything in between. A patient survival guide with tips on avoiding the pitfalls – in the second eBook. Detailed rehabilitation programs to give you the optimal post-operative recovery and reduce the amount of time you spend with therapists. Guidelines on how to manage your post-operative pain. This is critical to completing your rehabilitation successfully. 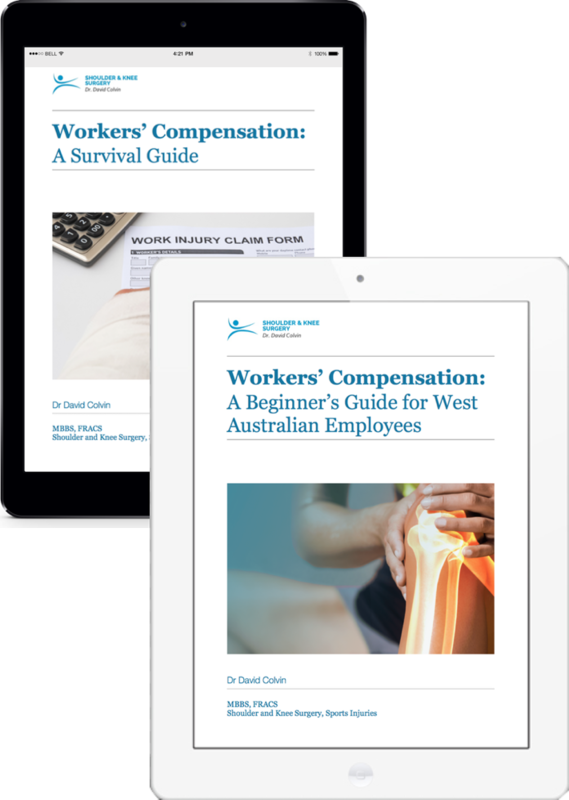 An informative blog written specifically for workers’ compensation patients which covers some of the frequently asked questions and common challenges encountered in the workers’ compensation scheme. Detailed explanations about all common shoulder and knee surgeries on his website. Knowledge is power, and understanding the nature of your problem and the treatment options will give you control over the recovery process. Patients often feel the workers’ compensation scheme has taken over their life. Dr Colvin believes that successful management of your work injury means handing control back to you. It is your injury and you get to choose your treating doctors, therapists and rehabilitation team. We need to get your injury treated and get you back in the game. Shoulder Arthroscopy is a procedure that orthopaedic surgeons use to inspect, diagnose, and repair problems inside your shoulder joint. They use a small camera, called an arthroscope, and surgical instruments to examine and repair the tissues in and around the shoulder. From knee arthroscopy to ACL reconstruction, from Tibial Tubercle Transfer to knee cap surgery, my practice can help you with the treatment you need to get back into the game. I am a Perth based orthopaedic surgeon with a subspeciality in knee and shoulder surgery and sports injuries.